While this is a solid introduction to the topic, I’d also suggest that you search around this site for more specific information on many of these topics, not only for concrete pavers but also materials as diverse as bluestone pavers to paving flags and everything in between. This will ensure you that you are making the right decision on the material to use when it comes time to install your next driveway, walkway, patio, pool deck, or other project. First, outdoor pavers are very strong and durable. You won’t have to worry about installing a new application for many decades, if at all – as long as they are installed correctly, of course. Second, these stones are very beautiful and unique – they will add more elegance to your home than other, more typical hardscaping materials (such as poured concrete and asphalt). Another of the strengths of outdoor concrete pavers is that they come in many different shapes, sizes, and colors. The shapes and sizes you select will depend on the particular installation you are pursuing. For instance, outdoor patio pavers will require certain properties that may or may not differ from driveway or walkway pavers. Depending on the size and shapes of the brick selected, many different patterns and layouts are possible. The color of the outdoor pavers – either single, double, or triple blends – will depend on any other projects installed in the area and on the general theme, style, and design of the home or business itself. We go over a discussion of paver patterns, paver colors, and more on these pages on this site. 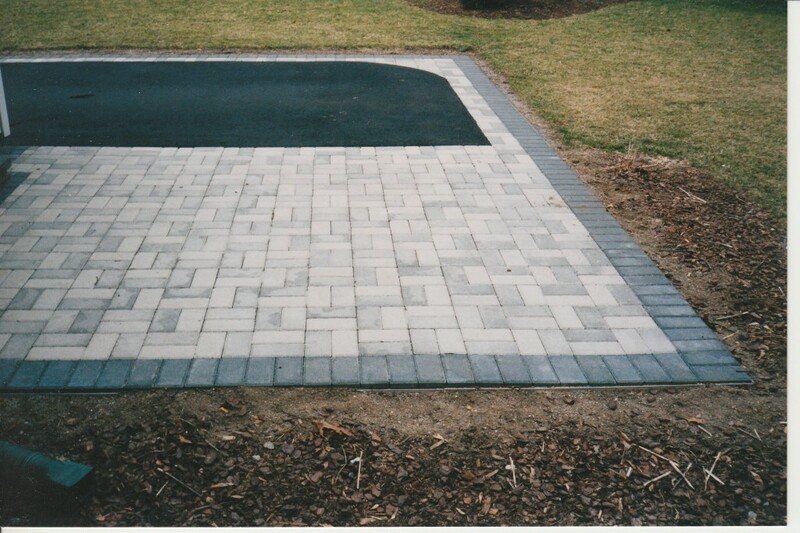 One of the best aspects of outdoor paver installations is that they are nearly maintenance free. Their flexibility and strength resists the rigors of freezing and thawing cycles. They will thus rarely crack (though they may settle). If any pavers do crack or chip or fade over time, they can be easily replaced: simply remove the damaged paver from the area, fix the base, reinsert a new paver, and fill in the joints with sand. It’s that easy! Many different interesting designs can be incorporated into an outdoor paving stone application. For instance, curves or circles can be added to give the project a more luxurious look and feel. Borders (called ‘soldier courses’) can be added to highlight particular aspects of the area. Fancy patterns and layouts can be used to draw attention to a walkway or patio, or a simpler design can be used to make the project blend in more with its environment. Whatever your intention, you can be sure that these pavers will meet your needs. There’s not enough room in this article to describe all the various kinds of designs that you can build. For more specific information, such as patio ideas, front yard walkway ideas, and others, check out the articles by following the links provided. Installation of outdoor pavers can be rather challenging, however. In most cases, it is probably best to hire a contractor with experience in this field. For the adventurous do it yourselfer, paving stones can be installed with the proper effort and preparation. The most important part of the installation is preparing the proper aggregate base (6″ or more, depending on the project) on which the patio, walkway, driveway, etc. will sit. This includes as well around one inch of fine sand that will act as the main bed for the stones. The area should be correctly graded (sloped) to ensure that water drains away from the home or business and to prevent flooding. Homeowners should also be mindful to obtain the proper equipment, such as plate compactors, necessary to complete the job right. These compactors can be rented for the day. For more installation information, always contact your local contractor or paver manufacturer. You can also check out our pavers installation guide here on this site. Note, however, that the particularities of your project may significantly alter the proper installation discussions – this is why you either need to have the experience to tell what is different or the guidance from a professional. As for other installation/DIY projects, sealing pavers is something that you can do to increase the beauty and lifespan of your pavers, though it is certainly not required. In general, outdoor pavers do best when sealed once every one or two years. More information on sealing pavers can be found by following the link. They can be easily cleaned with pressure washers or other cleaners, especially if any stains appear. They are also easy to remove snow and ice from, either with plows, shovels, or de-icing salts. More information on cleaning pavers and removing stains can be found by following the link. Though outdoor pavers are more expensive than other options, they more than pay off the investment over time. In general, you can expect to pay anywhere from $10 to $15 per square foot for your next project. The exact cost you’ll pay depends on so many factors that it’s impossible to list them all here – instead, check out this discussion of pavers cost for more guidance. In the end, though, nothing will replace an individual inspection by a local contractor. The range quoted above may seem kind of expensive to you, though. However, the important thing to remember here is that an outdoor paver project should be seen in part as a financial investment as well as simple consumption. These brick projects last longer than other materials (like concrete and asphalt) and they add more to the beauty and value of a home. Thus, if a house with paving stones is sold, the selling price will be higher if it has an outdoor paver patio, driveway, or walkway than if it doesn’t. This entry was posted in Basics, Project Ideas and tagged basics, outdoor pavers by Will Grander. Bookmark the permalink.